Are up by any chance watching TV or doing something else when you should be cooking dinner? Are you avoiding even thinking about dinner because you don't know what to eat, can't be bothered and are low on supplies? Or is that just me? It was certainly me last night! But I managed to go from that mindset to an absolutely delicious meal that was my favourite of the week. So despite using my iphone and having bad, poorly lit pictures I want to share how I managed this - because even if you don't recreate the exact same meal, there are some great principles that anyone can apply to help go from 'can't be bothered' to 'delicious dinner'. Below I step through steps I went through to create this meal that ended up being very nutritious, (4 serves of vegetables), interesting, tasty with required little effort and, for me, most important of all, little washing up. Just get started - walk into the kitchen and start pulling whatever ingredients look vaguely interesting from the fridge or pantry. Think about the techniques you know and what might suit what is in front of you, e.g. roasting, stir frying, steaming, salad making. Then think about how you feel - what type of taste you want and tie steps 1 & 2 together. For instance I knew I wanted little effort and was craving the roasted pumpkin / butter bean / brussel sprout smash I made year, but didn't have the ingredients for. So I decided roasting carrots was going to the closest I was going to get to what I was craving. Start cooking the basic meal you come up with - but don't be afraid to think of ways to add to it as you go. You will see that I did this. And it's what turned a really basic meal of roast chicken with two vegetables into a great warm salad with lots of colour and crunch. The pictures below, are a bit like me 'thinking aloud.' You can see how I went from simple to sensational by looking at limp leftovers in the fridge in a different way. You can see that none of them look that appealing. On the far left are chicken tenderloins. The sandwich bag contains caulifower rice and on the far right is spinach which I'd cleaned and bagged as part of some meal prep the previous weekend. The big challenge was I could only find half a lemon! I added Watercress to the ingredients. It's something I'm new to cooking with and not mad about, but it is meant to have a higher nutritional value. I abandoned the beans in favour of broccoli that was buried at the bottom of the crisper. The broccoli looked really unappealing, but needed to be used up sooner than the beans. After popping the chicken and vegetables in the oven (200) for the first 20 minutes - I had a few bouts of inspiration. This is the benefit of starting to cook - once started you get on a bit of a roll. I remembered I had an open pack of pistacios thought they might be good for extra fibre, crunch and colour. The guilt about the half eaten pomegranate got to me. It's such luxury item to buy and was meant to motivate me to get back to healthy breakfasts (unsuccessfully) - so I thought better start using it up - and it would make the salad look pretty. b.) cauliflower rice didn't excite me, I was really craving the comfort food / winter taste of barley. So I put on a pot and literally put the entire contents of the bag of barely into it. THEN I thought - Now going all out using things up that don't look that appealing, I should incorporate the avocado that is looking unloved - and in danger of becoming food waste. Watercress, pistacios, pomegranete and avocado prepped and ready to use. 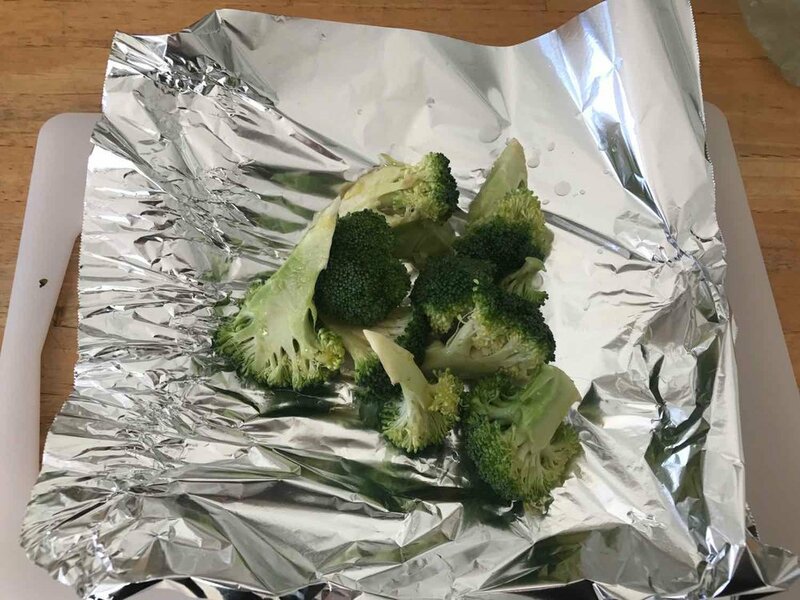 At the 10 minute mark I wrapped the broccoli in foil and added it to the oven. I don't have a microwave and didn't want to dirty a saucepan steaming it - so this seemed an easy alternative. When the barley was cooked and the vegetables had finished roasting, I simply chopped everything up into large chunks and combined them in a bowl before putting into a plate and topping with the pistacio nuts, pomegranate seeds and avocado. I'm not a mad fan of salad dressing, but it actually would have been a nice addition to this meal to bind everything together. My choice would have been some form of dijon mustard dressing with lemon and thyme. I found a good recipe on the She Likes Food blog. What I love about looking at meals like this - is seeing that it's full of wholesome, nutritious, wholefood ingredients bought together in a way that is tasty, delicious and fuss free. Be kind to the eftovers and the half chopped vegetables lurking unloved at the back of your fridge! Love them and they will love you back by adding crunch, colour and variety to you meals. Plus lessen your guilt about food wastage. Think roasting when you want to minimise effort. 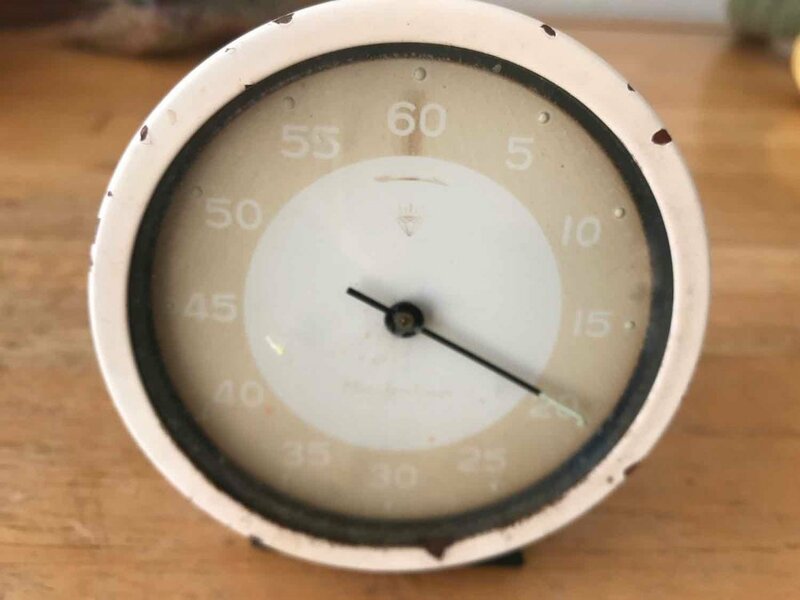 It takes longer to get a meal ready, but that's mainly passive time, when you can be off doing something else. DO put in the effort to have pre-cooked grains, carbs and 'fillers' such as barley, rice, pasta, cauliflower rice etc. in the fridge. The payback is huge. Putting the effort in once to cook and bag a 'filler' turns many meals from Two Pot Chores into One Pot Wonders. And in reality, the only extra effort required is the portioning up and bagging at the end. The actually boiling a pan, putting in the barley etc. is the same amount of effort for one serve vs 10 serves. Put pan to cook barley by following the instructions on the packet. In a small bowl squeeze half a lemon, add leaves of 3 - stems of Thyme and 1 tablespoon of olive oil. Combine and then marinate the chicken for 10 minutes while you prepare the vegetables. Peel and chop carrots in half and into chunks so all pieces are roughly the same size for even roasting. Along with the corn, add to a small roasting pan and coat with 1 teaspoon of olive oil. 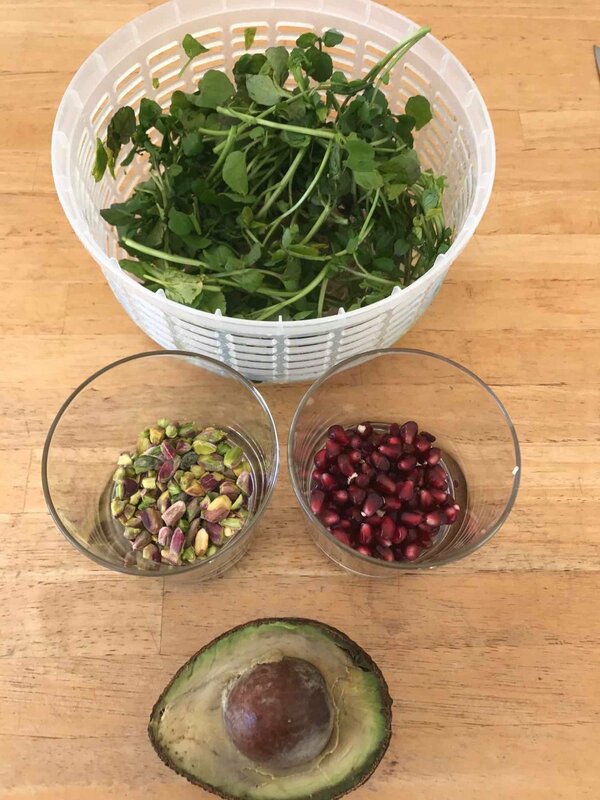 In the meantime prep the watercress and spinach (I ended up using both); the pomegranate, nuts, avocado and dressing if you are making it. 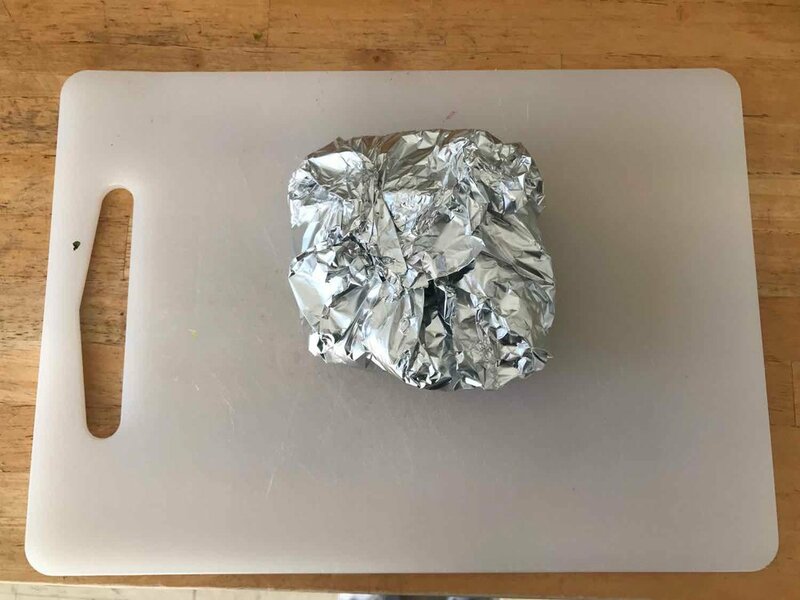 When the chicken is cooked, remove from the oven and wrap in foil to keep warm. Set timer for 10 - 20 minutes, or whatever you think is needed to roast the vegetables how you like them. For me I like to see a bit of brown and caramelisation so I cooked them for an extra 20 minutes. 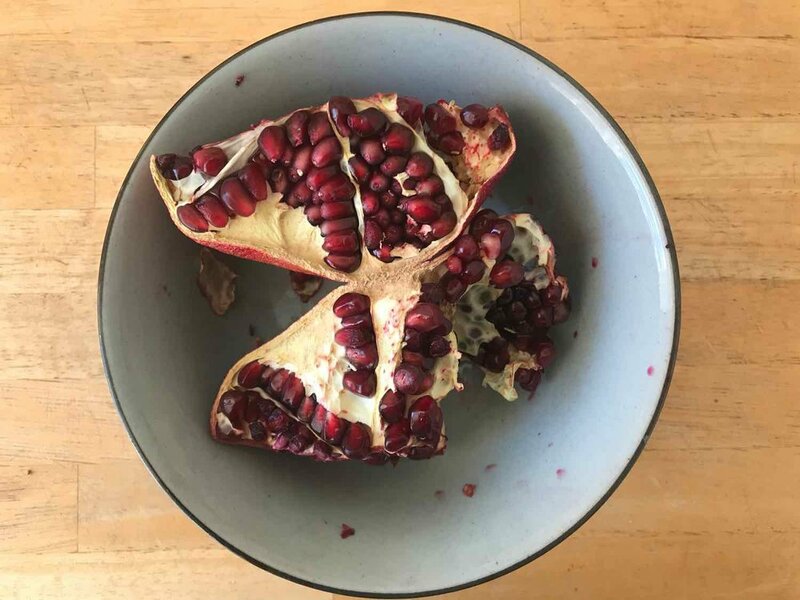 Transfer to a plate and top with nuts, pomegranate seeds and avocado. Post picture to Instagram #dinnerdesperado or share with the dinner desperado community on our Facebook page. If you don't like barley, rice, pasta or cauliflower rice can be used.